This is my first attempt at a newsletter since taking over the position of Secretary of the Midlands Dexter Group this spring so I am still green around the gills. Before I bring you all up to date can I say to all concerned on the existing committee and one or two past members how much I appreciate their support in very practical ways with my new role. I am afraid my IT skills are awful and inevitably I will be making mistakes so hope you will all bear with me. Another change to the committee in the spring was the vacancy of treasurer being filled by the very able and willing Sue Bancroft who has kindly agreed to stay in post until at least the end of the year. On behalf of you all can I say thank you to Sue. It is quite an onerous experience chasing people up for subs,keeping an eye on expenses and balancing the books. Now for the interesting stuff which helps to keep us together and enjoy the breed. First off this year was a lecture/interactive discussion led by Steve Borsberry,senior vet at a large practice in Warwickshire. The meeting was held on a dry but chilly morning on the last Sunday in February at Weston-sub-Edge village hall. Steve made a complicated and potentially dull talk on Bovine Viral Diarrhoea both interesting,amusing and entertaining with the skilful use of a rag doll as a prop. It made us all think about whether we should have our own herds assessed for BVD in view of it's consequences if any of your animals get it. Vaccination at the right time can prevent it. Bless him - although he recommended we give serious thought to having a veterarian assessment for BVD he wasn't trying to leech business and suggested you approach your own vet. Steve then went on to educate us about the much more rare and difficult to deal with Johne's disease. There must have been about thirty of us attending and all brought a food contribution for lunch before we departed. On the 8th of May Lin and Lucy Blackwell hosted a DCS Beef Committee Open Day on their farm at East Challow in very rural Oxfordshire. Goodness those two ladies work hard and so we were fortunate they were prepared to spend a big chunk of the day talking us through their enterprises. They even made time to organise a hot lunch for us at very reasonable cost. In addition to having a single suckle Dexter herd they have a significant number of another herd of rare breed Irish Moiled cattle. They also rear Fresian bull calves,have a flock of rare breed sheep and Lucy does relief milking. If that wasn't enough Lin and Lucy have over recent years invested heavily in developing their own cutting room in one of the outbuildings and butcher their own meat. Lin said; "We started attending Farmers Markets in 2004 selling our home produced Dexter beef. Over the last 12 years we have learnt an awful lot and changed a lot of things but one thing remains constant and that is the quality of the product we sell namely Dexter beef. The abattoir is 15 miles away and the carcass is delivered to a local butcher and hung for 21 days before being cut into primals. Once collected the final cutting and packing takes place in our purpose built meat room. Burgers and meatballs are made to make use of the trim. Offal is packed and sold at the markets as well. It takes around 6 hours to cut and pack a carcass ready for market including mincing. To make burgers and meatballs takes another two hours. We use vac pack for all cuts except the burgers and meatballs which are put on polystyrene trays and over wrapped". Cost of abattoir,delivery,butcher to produce primals,vac pack and disposal of waste £210. At the end of the meeting Lin and Lucy said members are welcome to give them a ring; Lin on 07767880318 and Lucy on 07899981551. On June the 5th. Val and Malcolm Eykyn hosted a herd visit and farm walk. We were very fortunate to have a beautiful sunny day and a leisurely conducted tour of the small holding of 50 acres. This was preceded by being given a summary of the marketing and direct sales methods they use to their consumers. Several of their customers are doctors and one is a heart specialist so the Dexter meat can't be that bad for you!! Half the farm is devoted to permanent pasture and the other half to Higher Level Stewardship crops of "Wild Bird Seed Mix" and "Pollen and Nectar" rotated every three years and "Flouristically Enhanced". Put simply it is growing wild flowers for the benefit of endangered species of birds and invertebrates sponsored by Brussels instead of growing commercial crops. At the time we walked round the wild flowers were growing thick and fast and Steve Poole was heard to say " What a waste feeding that lot to the birds and the bees when my cattle could be having it!" To make this part of the walk more interesting Mike Robinson local specialist in HLS from Natural England explained the rationale for growing these crops,identifying the individual wild flowers and the benefits that had been achieved so far. 20 feet up an Oak tree in the middle of one field was a barn owl box which had been erected 4 years before with no result until two weeks before a pair of Kestrels had adopted it and successfully bred 5 chicks that were ringed by a specialist 3 days before. Everyone was shown a photograph to prove it! When we got to the Dexters - all 48 of them in the same field,Sally Poole did no more than lie down in the middle of them! They didn't bat an eyelid. We got back to the farmhouse garden for lunch and had an excellent lunch contributed to by all. It was so hot by then some of us had to sit in the tent. Finally we had an open business meeting before departing. 25 people attended with 13 apologies. Most of those apologies because busy farming time of the year. Now to forthcoming events: First is a herd visit see Dexters on conservation grazing on the Leckhampton hills - you should have already had an e-mail from me with the details. This is on Sunday 4th September 11.00am start from Leckhampton Scout Hut GL53 0AL. And being kindly hosted by last year's winners of the small herd competition Anne and Annette North. Please let Anne or myself know if you are coming so we can cater for numbers. We are hoping to persuade Professor Mike Lee to come and talk to us. He is a leading world scientist into the research of grass only fed ruminants who has recently published some papers on his "cutting edge" results. His findings are so significant he was asked to present them to the "Royal Society". They have the potential to change the public's perception of this type of red meat which up till now has received a persistent bashing in the media. This could happen in the Autumn/Winter so watch this space. AGM. This has been booked for Sunday the 4th December at Hardwicke village hall starting at 11.00am. We are hoping to book a good pub nearby for a hot meal/Xmas lunch afterwards for those that can stop after the meeting. Your committee have also asked your secretary to arrange another trip to Lower Watchbury Farm in January/February 2017 to see endangered species of wild birds while they feed on the "Wild Bird Seed" mix. We are hoping this will be conducted by Matt Willmott of Natural England who specialises in wild birds and has the unique ability to recognise them by their call even he can't see them. If we can arrange that you will need to bring your binoculars. Steve Poole suggested at the last open business meeting in June to have another Vet lecture so your committee will be exploring that for the late Spring if there is time. Mike Bancroft has agreed to try and arrange for the group to make a visit to the Applebie's organic dairy farm in Bretforton proceeding to their ice cream factory afterwards. This could happen on the first or second weekend in May. Mike Bancroft has also kindly agreed to arrange next year's herd competition which the committee have decided should be judged by a non Dexter judge for a change. This will be held over three days with committee members volunteering to drive the judge to the various herds competing. Please think about entering your own herd large or small next year when applications go out. 1. Improvements to the group exhibition stand. 2. Research possibility of sponsoring two classes at the next Three Counties Show. 4. Design a new club leaflet to include in a new members pack as well as send out to existing members. Thanks for your time in reading this and will up date you on events in the next newsletter in the New year. I would be grateful for your ideas in improving this newsletter as this is as you know my first shot at it. We​ have a "closed" herd of 40 Dexters & breed for beef, whilst retaining couple of heifers each year as replacements. 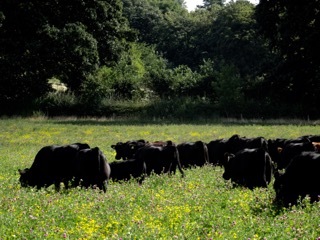 Cattle are grazed over 50 acres of permanent pasture & wild flower meadows. We grow the wild flowers as part of the Higher Level Stewardship scheme to encourage populations of endangered species of wild birds, bees, butterflies and other invertebrates. home-produced haylage & a high magnesium salt lick. Beef animals are slaughtered​ at 30 months & after hanging for 3 weeks, butchered, packed, labelled & frozen. We sell to private customers in boxes ranging from a 1/16th to a 1/4 of a beast. We market to repeat customers,​ through ​​​​recommendations & networking. The​ Boram Herd of Pedigree Dexter Cattle was established in 1990. In 2001 we decided to concentrate on Dexter beef production & have built the herd number up to 52 spring & autumn calving cows, all home bred. We run two separate herds - black & red, & retain heifers for replacements in our own herd with the remainder being sold for beef. Our beef is sold locally to pub/restaurants; coffee shop; butchers (one local & the other in North London); North Cotswolds Farmers' Market​​s & private customers.